I am grateful to Ilana for guest posting today at Your Kid’s Table while I’m on maternity leave with number 3. She works over at Fun and Function and is a physical therapist. 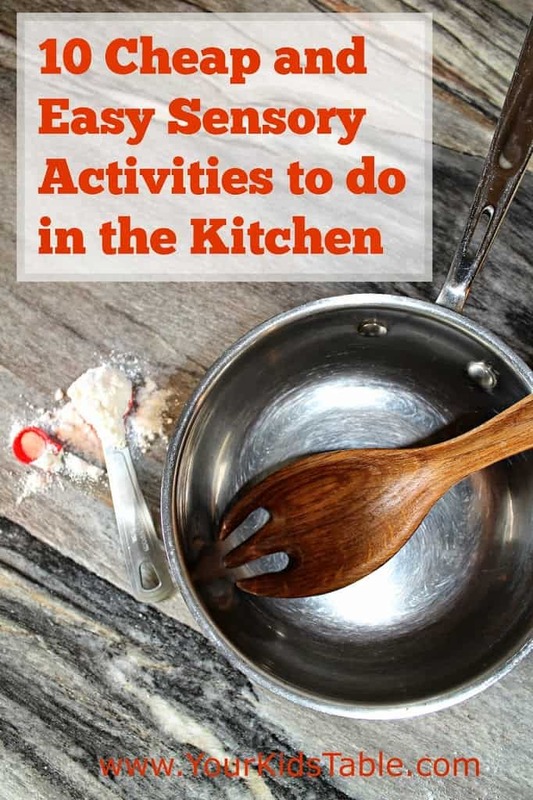 She has some unique and fun sensory play ideas that you can do – easily – with your kids in the kitchen! Plus, you will find a coupon code and some product recommendations at the end of the post. 1. Flour Therapy: This is by far one of my favorite activities. It’s a bit messy, but its like no other feeling your kids will experience. Put your child on the floor (or for younger kids up in a high chair) with nothing on but their underwear or a swimsuit. Place a bin of cooking flour in front of them and hide a few objects inside. Have your kids find the objects. 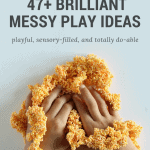 Let your kids get messy. This is a tactile experience and you can bath or shower them off later. For gluten allergies, you can use gluten-free flour. 2. 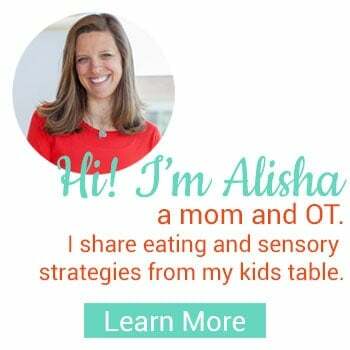 Frozen Treats and Crunchy Snacks: The kitchen is full of great oral motor activities. Use carrot sticks, celery sticks, frozen marshmallows, cold licorice sticks, or ice pops to provide a heavy mouth workout, which can filter out stress. The mouth can exert over 250 lbs. of pressure to provide a great sensory-motor workout. 3. Heavy Hand Work: Get their hands working. Try baking bread or making pizza. Let them use their fingers to pinch, pull, squeeze, and sprinkle. And, at the end, they get a tasty treat! 4. Learn to Measure: Visual processing is key here and if it’s a struggle, learning to cook is a perfect activity. 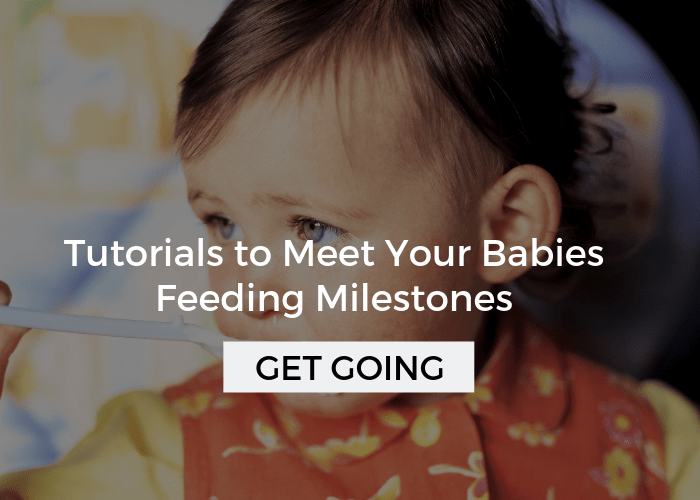 Pick a recipe or cake mix and let your kids be the master of the measuring cup and spoons. They will learn to gauge, balance, pour, and measure. 5. Motor Planning: How many steps does it take to make a sandwich? This is the key to motor planning. 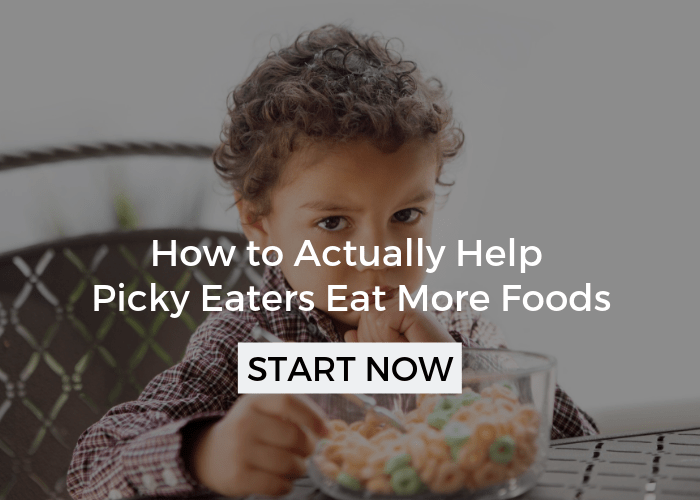 Let your kids plan a simple snack and think through and write down the steps needed to accomplish it. 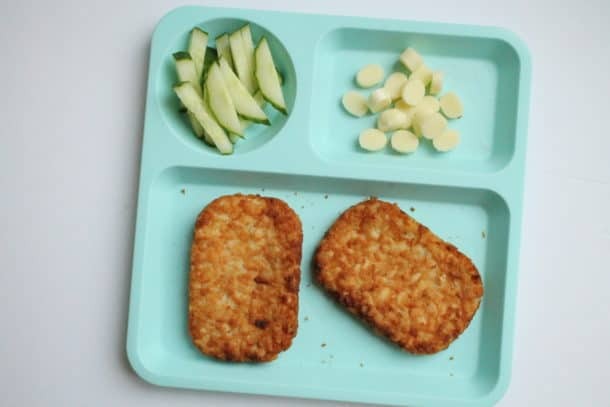 Start with a sandwich or something that requires more than three steps, but not a full gourmet dinner of fifty steps. 6. Water Play: You just found your dishwasher! Let your kids hand wash the dishes. Water and suds provide one of the best sources of sensory therapy available and your dishes will be clean! Well….if not, you can always toss them into the dishwasher afterward. 7. 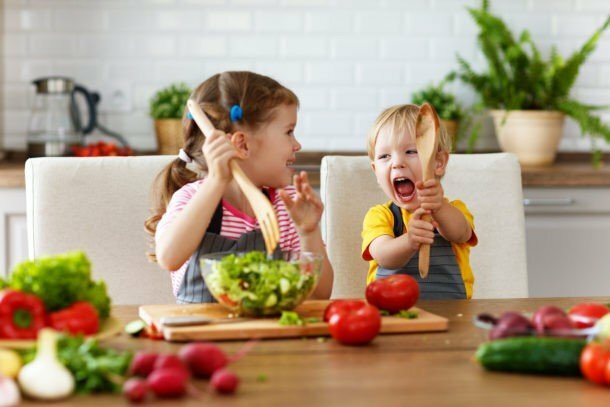 Hot and Heavy: Teaching your kids about safety in the kitchen is crucial. Show them how to turn on and off knobs (age appropriate). This not only is a safety precaution, but also teaches them responsibility and organization. 8. Pots and Pans: Got a musician on your hands. Turn over some pots and pans, hand them a spoon, and you may have a one-man-band. Let them bang and hit. Add some music and you may even join them! 9. Sorting and Organizing: Are you forever wanting your silverware drawer cleaned up? 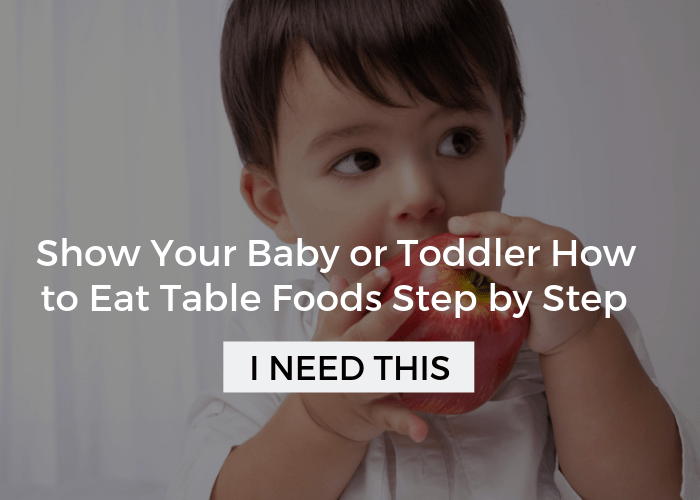 Have your child sort the silverware or organize the Tupperware. They will be helping and learning organizational skills necessary for sorting other things later on. 10. Mop it Up: Heavy work (lifting, carrying, pushing, and pulling) provides a wonderful sensory workout. Have your kids clean up under your cabinet, put away the pots and pans, empty the garbage, or mop up the floor. And yes, when they are not watching, you can go back after them and clean it all up yourself; but really, you may just need a rest from all the heavy work! Fun and Function is Offering a Special Discount Code in Recognition of ADHD Awareness Month! October marks the celebration of ADHD Awareness Month. To show support, Fun and Function is offering a special two day sale throughout the entire site. On October 22nd and October 23rd shoppers will receive 10% off using the code ADHDawareness1014. Fun and Function offers skill-building toys for children of every ability, promoting inclusive play at home, in school and outdoors. Sold online and in toy stores nationwide, Fun and Function’s award-winning line is recommended by parents, pediatric therapists and educators, and helps children achieve their best and have fun at the same time. 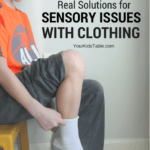 The discount code will work for items throughout the entire site, however since it is ADHD Awareness Month there are a few key items to look for to help those with attention disorders. The following items will be included in the 10% off and are great to buy for your child now or to save for the upcoming holiday season! Break Boxes: The Break Box can be customized with award-winning solutions to help classrooms succeed. Teachers often use these to gain back students’ attention or calm their behavior. 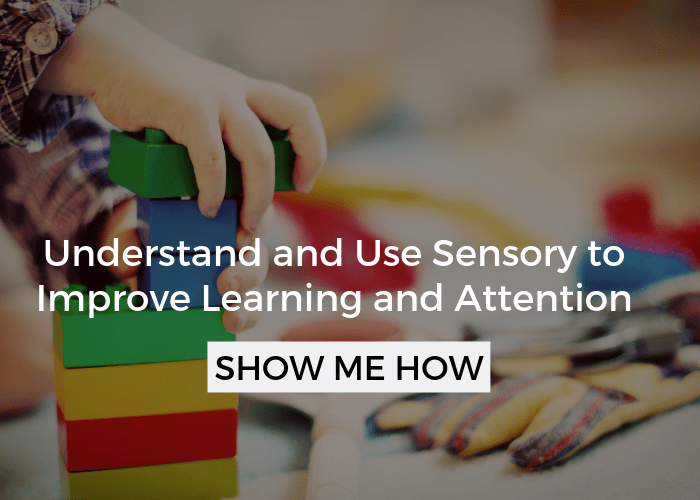 They are packed with sensory items that renew focus and concentration. Stretch Denim Vest: The weighted compression vest is now available in a stretch denim material and encourages calm, focus, and concentration for learning. The deep pressure and balanced weight are gentle, calming, and reassuring. Space Explorers: The ultimate body sock that stretches with your body allows children and young adults to crawl, jump, stretch and pretend. The Space Explorer body suit allows for calming deep pressure and heavy work for children who need sensory focus or those tactile defensive children. 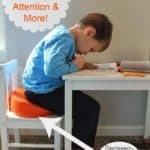 Lean N Learn Cushion: This specially designed seat cushion props children up into an active learning position. Slightly tilted forward, the cushion allows children to be more alert and engaged in the classroom. Break Bag– A portable version of the Break Box, the Break Bag is great for families on the go. The bag includes items for motor/heavy hand work, fidgety children, and visual stimulation. It can be brought in the car, on vacations, or just a trip to a friend’s house. To see all of these and other ADHD specific products, check out our ADHD Solutions page. Make sure to join us on October 22 and October 23 for this great sale! So many great ideas! Such a simple thing to combine sensory play with time in the kitchen. My little 18 month old would love to try some of these. Thanks for the great post.